Have you heard the saying, “Make a plan and watch god laugh?" Every day I was going to do accomplish five things. Today I had the whole day, which means I'll waste more time. Someone in the neighborhood said he'd loan me a cable for a network experiment that I was doing. I hadn't been to his house, so I drove to his street and got out of my car and walked across the street to see the house numbers. The next thing I know I kicked something laying on the street. I was surprised because I thought there was nothing on the street. 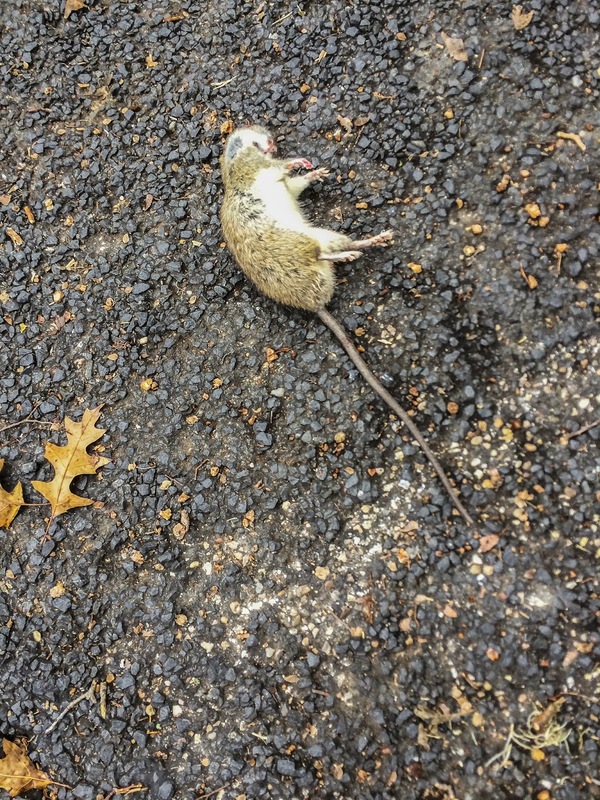 I looked down and there was a dead rat. I've been trying to be mindful of my actions. Here was such a simple task. Walk across the street. Find the house and get the cable from the porch. And then the rat. It is always a rat that goofs up plans. The rat just wasn't supposed to be there. He wasn't part of the world I had constructed. Last night I was reading about the debate between sudden and gradual enlightnment. This was certainly sudden enlightenment. But what did I learn? This is not my world. It belongs to all of us, and what happens is the result of many paths crossing. There is not one story, but rather, all these stories intersect. The rat had a story, perhaps that it had been poisoned. I had a story—my computer network wasn't behaving well. And you had a story, doing what you do. But these aren't independent stories. They intersect, sometimes with a thump. Kicking a rat is a unique experience. For a moment, my foot felt this rather plump fellow. My day continued, with time flying out the window and I still hadn't done my five things. Then a friend called and I knew he'd be out of touch for the next three months so we talked for over an hour. I still had time. Lots of time. Then Sarah called about the prompt. Oh, I needed to do that. An easy job... just print it out. Then Bill emailed about the prompt... now I needed to do a little research. And then my printer wouldn't work so I had to mail the document to another computer to get it to print. Still a couple of hours left to do my five things. And then my son called. He was very excited to talk about his new project, so we talked a long time. And the clock ticked and the rat lay in the street, and the intersections were all there teaching me how interconnected we all are. I’ve been on the wagon for two days (counting today(. I posted pictures on Please No Words, I did a Torah post on Kenshin’s Bar Mitzvah, I wrote something for everyday I think (this for today), and I logged my food. In addition, I’m supposed to do some medical stuff which I did too (mostly(. I was good, so to speak. Better, at least. It has been since Nov. 11 since I did this. Amazing how seven weeks can fly by. I did accomplish some stuff in the meantime, but not stuff that prevented me from doing the stuff that is important. I wanted to set up a computer with linux and ended up putting it on two computers. I have an old G4 laptop that will become the next recipient, though it works so well now after I did a clean install of an old operating system. I’ve become interested in resuscitating old technology. I’m starting to like my iPhone 5S better because it isn’t the most recent model. “New” can become a disease. I once hear a great lecture on “new” by a photography critic. “New” can be an insidious virus. I’ve been dealing with waking up (Zen talk). That for me is to realize the consequence of my actions. It is my Zen “practice period” focus for the next three months. Of course, if I beat myself up for being asleep it will not be fun. I want to improve my practice of archery, so to speak. I want to hit the target more often. Yet archery may not be about hitting the target as suggested in Zen in the Way of Archery. We think of tests, like the SAT or the GRE. But what about the simple task/test of washing one’s hands. How well can that be done? Do we get our hands clean? Do we love our hands? Or even typing one character on a keyboard. Is there time in our life to touch everything as if it was very very special? I think so. This is the dilemma we have every moment—What shall I do (and how?). Supposedly a teacher makes 1500 educational decisions every day. A driver can make 250 conscious decisions every mile. I’m tired just thinking about it. I tried to make conscious decisions as I went shopping yesterday. At the grocery store there was a white woman with a little black boy. Her love for the boy was obvious as she kissed and hugged him. He seemed about three and she held him in one arm, with a satchel of groceries in the other hand. She was behind me in line. I told her she could go in front of me. At first she politely hesitated, but then she accepted. I was aware that my decision made her life a little easier. I was also aware how my action made me feel so good. Then the cashier asked if I was having a good day and I said, “yes. How has your day been.” I looked him in the eye and cared for that moment who he was and how he was feeling. Again I felt good. It was not my intention in doing either of these “mitzvahs” to feel good. I was still recovering from someone butting in front of me a week ago. I didn’t say anything to them. I just felt pushed aside for a week. At Costco, they check your membership card as you enter. For those, like myself, who frequent the warehouse store, most of the checkers just let you by. A new checker was there, and asked for my card. I decided to just walk by, with the defiance that Michael Brown may have felt when the cop asked him to get off the street. The checker yelled after me, “may I see your card, please.” But I just kept walking. And then I felt bad the rest of the day. You might think I’m being very rough on myself. Actually I'm just trying to see the effect of my actions. My father always complained that I did the wrong things. So I’m thinking...could I do the right thing if I really tried. I don’t mean almost the right thing...but really really the right thing. Could I return a grocery cart to its resting place as if it was a super thin egg shell? Could I set a tea bowl on a table so softly that I wouldn't wake it up? Let’s see how I do tomorrow. Lunch today at Casa de Luz. I was offered an opportunity to choose my piece of pie. My first thought was to take the biggest piece. I eyed a big whopper that had no pie shape whatsoever. It must have been the last piece in the pie pan. But it was behind the others, and actually did not look that appetizing. It was more of a garbage heap than an appetizing dessert. Then I eyed a pretty miserable little piece in the front row. It wasn't much bigger than the others and was poorly formed, but it spoke directly to my heart. “No one will choose me,” it cried. “I will,” I answered. And I did. At the park yesterday I came upon a broken and decayed limb that must have fallen from some height in that it had shattered into many pieces. I eyed the arrangement of the pieces and commented to my friend that this arrangement was anything but random. Just because there was no apparent pattern, the arrangement of the various splinters of the limb seemed determined conditions—primarily by the fall. Similarly, I eyed my plate after I scarfed down that piece of walnut pie. The arrangement of the remains was impeccable. No skilled set designer could fabricate such an authentic configuration of crumbs. “Is anything random,” I remarked, looking at the beautiful swirls that moved in a figure 8 pattern. Supposedly computers can't generate random numbers. The numbers can be random enough to be useful, but not truly random. “Is anything random?” I asked. “But we aren't computers,” my friends at lunch suggested. To which I responded, “Oh, I think we are. We have input and output.” Then they started to talk about their friend who was an astronomer. They suggested that he would agree, adding that they were on one side, the astronomer was in the middle, and I was at the other end (wherever that might be). I mentioned my fixation on randomness to a Zen teacher yesterday and she replied that it didn't matter whether randomness existed or not, but what mattered was how I worked with it. If the universe is the result of conditions, are my actions also the result of conditions? Today I wondered if everything but people is a product of conditions. Am I really free to do as I please? What will I do next? Will I go home after Zen writing tonight, or will I go by Walgreen's and pick up a prescription? Will one choice be the right one, according to my programming, and the other...well...wrong? Will I get an error message? Now I'm feeling a little self-conscious about believing I'm making decisions. Did the branch decide how it would splinter after the long fall? Did the pie maker orchestrate how the piece of pie looked, shoveled onto a plate? I wrote this as a comment to the North Korea/Sony incident. I try to see the other side of things. It is too easy to take pot-shots from the peanut gallery. Perhaps in some of these instances the threats remind us that we aren't being kind. Maybe Sony learned that they can't make fun of world leaders and call it entertainment. I understand that the cost of caving in to threats, but I think that the benefit of such actions is that they makes us reflect more on how we are treating others. Dukkha (Pāli; Sanskrit: duḥkha; Tibetan: སྡུག་བསྔལ་ sdug bsngal, pr. "duk-ngel") is a Buddhist term commonly translated as "suffering", "anxiety", "stress", or "unsatisfactoriness". I sit quietly in my chair, thinking how I attach myself to the renegade thoughts floating through my head. Some are easy to resist. I watch them come and go. Others seem to “get me,” kidnapping me until I can escape back onto my seat. These thoughts that wait around in my head are not strangers. They seem to reside in me, and jump into my conscious mind whenever I pause from the busyness of life. I'd like to call them “old friends,” but, honestly, they are kind of boring. I hear an airplane overhead. Forgetting where (or who) I am, or what I'm doing, I eagerly board the plane. I scold myself for doing so, but still, I find myself sitting in my favorite aisle seat. Soon the plane noise stops, and I return to me and my seat. And then, just as I congratulated myself for jumping ship and returning to my chair, the noise starts again and I'm back on the ship, looking at the clouds passing by. Finally the plane quiets down, and other noises in the temple start appearing. They are not so seductive as the plane. I worry that some might not like these noises, calling them distracting. I try to think of them as opportunities for practice. But actually, they were fairly easy targets as they are unenticing, unlike the plane that buzzes through the sky. I wrote the other day about how active meditation can be. Will the timer go off? Will people be irritated that our environment isn't perfect, devoid of all stimuli? Why do we call it meditation, anyway? Robert Hutchins, the architect behind the Great Books, and president and chancellor of the University of Chicago wrote "read critically, think independently, discuss good naturedly the issues of the day." I can’t say much about the military since my experience was so brief (one semester in ROTC because it was required at U of I). I did ride on the plane with a student from West Point and was questioning him about what he’d do if his sergeant told him to do something that seemed wrong. He said that he’d been taught to do what is right, not what he was told. That’s what we learned from the Nuremberg trials. Going back to the Garden of Eden, I think that eating the fruit was the beginning of independent thinking. I would like to believe that independent thinking is a prerequisite toward finding and following a spiritual path. That is what Christ, Buddha, Moses and all the other leaders did. And Gandhi as well. Buddha said that if he says one thing, and your teacher says something different, you should follow your teacher. Judaism is not founded on belief but rather on action. It is about humans discovering what is human. What Linji was talking about was that mindlessly following a path is no different than being a prisoner, shackled and bound. I wouldn’t be pursuing a spiritual path if I thought that meant losing my independence. The fact that paths are ultimately unique means that we must, yes, must, be independent. Otherwise we are simple sheep, doing the right thing, not as humans, but rather as animals. The surrendering, for me, is seeing our interdependence. When a gear shift grows up, it stops thinking of itself as a gear shift, but rather thinks of herself as an integral part of a car. In the same way, we surrender minute by minute. When we drive in traffic we can choose to be part of the dance of cars, or to drive in our own direction which will likely lead to an accident. Choosing makes us human. But following the crowd blindlessly will lead to a pile-up. We have to be ready for independent thought. It is hard to be nondualistic when doing qigong, or when thinking about being separate from the air we displace. We have stale qi and fresh qi. We move out the stale and move in the fresh. I doubt that one qi is better or worse than the other. It is more like how we get hungry or tired. In Strand’s poem, he ends with, “I move to keep things whole.” In fact, we do the same in qigong, moving qi to keep us energized. The air moves as the man moves. They switch places for a moment until the air is returned. Is it the same air, having been displaced by a man? It now has been stirred up. It has a little tale to tell its grandchildren. “I move to keep things whole.” I thought in college sometimes that I’d learn something and then I could ride in this sweet Cadillac and not have to struggle one bit. Ha Ha. That was a joke. Even a poet laureate needs to move to stay alive. Even the Dalai Lama needs to meditate four hours a day. Is meditation and moving much the same? I think so. And what is movement? When I am still, I really move. My thoughts can be as chaotic as Niagara Falls. And when I move, I am still—busy but somewhere else. Is one better than another? Or are they brother and sister—one complementing the other. Wordsworth wrote that “Art is the spontaneous overflow of powerful feelings, recalled in tranquility.” It is one action for a man to walk around displacing air, and a much different action, after the fact, to remember and admit that one had done such an interaction with the world. It might be a obvious to a very precocious third grader, but not one ordinarily observed by an adult, unless, of course, they were a poet laureate… and a meditative one at that.